If you’re an expatriate, setting up an offshore company — whether an International Business Company (IBC), a Limited Company (LTD), or a Limited Liability Company (LLC) — may be an ideal solution when providing personal services. A Personal Services Company (PSC) could enable those who live abroad from their country of citizenship to take advantage of tax planning set-ups and reduce tax burdens should they not be a current resident in their home country and should they travel often and bill abroad for work purposes. By setting up an offshore company, an expatriate who works as an independent contractor — regardless of which industry they work in — may consider billing through the company as opposed to billing as an individual. The company owner can then enjoy dividends, consultation fees, and/or a salary from the incorporation registered offshore. 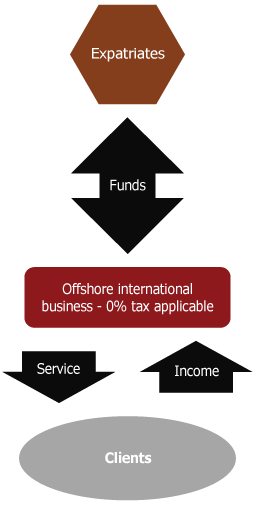 A Limited Company that functions as a Personal Services Company may also be efficient for streamlining invoicing, and for enabling the set-up of an offshore bank account, which allows the beneficial owner to collect money from companies based anywhere in the world and work in the currencies that most suit their needs. Incorporating an International Business Company (IBC), a Limited Company (LTD), or a Limited Liability Company (LLC), such as in the Seychelles, Hong Kong, or Delaware, respectively, also allows the independent contractor to demonstrate professionalism via a registered company name rather than posing as a sole trader. The business owner can also enjoy privacy when registering a company than when registering as a sole trader, and a sole trader cannot opt for appointing a nominee director and/or nominee shareholder. The offshore company can also allow an expatriate to hold international investment instruments including listed and unlisted shares in other companies, bonds, and commodities in the name of the company. SFM works across more than 15 different jurisdictions, and we offer expatriates the possibility of forming an offshore incorporation in as rapidly as 24 hours. Your company may then open its international bank account within a matter of days.